Are you facing a problem where email attachments open slow in Outlook 2016, 2013, 2010, or below versions?? Here is a solution for fixing the error related to same. So, let’s begin! Whenever a Microsoft user tries to open message attachments of Outlook or tries to save them, he/she experiences the slow performance of Outlook. Instead of opening attachments instantly, clients experience a short time duration delay in the majority of cases. This the reason why we have decided to deliver solutions on ‘How to ‘fix attachments open delay in Outlook’’ problem. 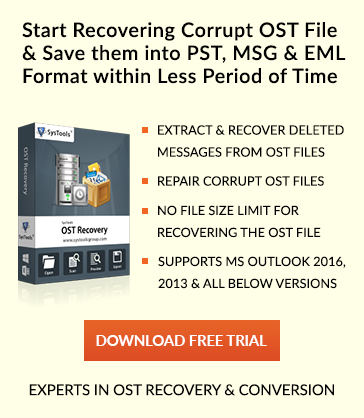 Additional Trick: – Before going deep in fixing this issue, first Convert OST to PST format and save resultant file as backup and ensure zero data loss. All the provided reasons for problem cause slow down the performance of Outlook, majorly while opening Outlook attachments. It can also crash all attachments of the email and hence, generate a serious problem for end users. These causes can restrict one from viewing attachments. At the end of the day, all these situations are going to make customers frustrated and thus, a reason for switching the mailing platform. The absence of IMAP mailboxes might be the reason of the error. Therefore, you need to verify that you have completely downloaded IMAP mailboxes for avoiding errors in the future. An antivirus application must be installed on the system, which is friendly with Outlook. Safe Tip: Sometimes deactivating antivirus protection settings also makes MS Outlook program executable in a smooth way. Without any delay, you will be able to open Outlook attachments. Are The Provided Ways Worth?? Well, the suggested manual approaches require identification of the cause because of which the error occurs. This cause recognition process is difficult for a novice user or even for a person who is not very well aware from Outlook. Apart from all this, it is not guaranteed that solutions will fix ‘attachments open slow in Outlook 2016, 2013, 2010’ problem. Now, what to do?? Don’t worry here is the solution recommended by many enterprise users. This workaround involves repairing of OST file with a well-known tool i.e., migrate OST file to PST format using software. It is having few commendable options, which will definitely fix the problem faced by Outlook users. The product does not require any supportive application for its working thus, an effective approach to resolve the issue. Different ways on ‘how to fix attachments open delay in Outlook’ issue is discussed in this blog. The solutions provided to you are described with both their pros and cons. So, it is totally your choice which one you want to opt for.